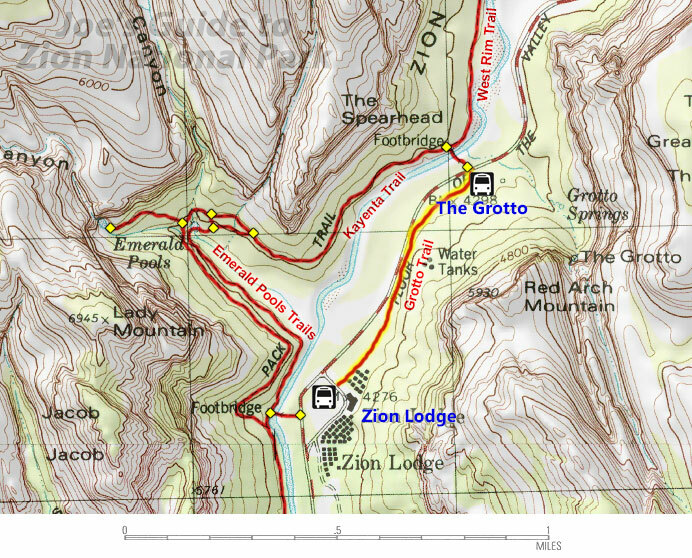 The Grotto Trail is a short half a mile trail that starts at the Zion Lodge (the 5th stop for the Zion Canyon Shuttle) and ends at the Grotto trailhead and picnic area (the 6th stop). 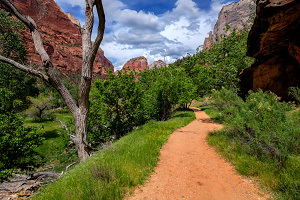 The trail is almost completely level as it follows the canyon floor though a pleasant wooded meadow and then runs alongside the Zion Canyon Road before ending at the Grotto. If you are staying at the Zion Lodge, you can take a stroll on this trail to the picnic area at the Grotto. If you are hiking the Emerald Pools Trail, you can make it a longer loop hike by taking the Kayenta Trail to the Grotto and then the Grotto Trail back to the Zion Lodge. If you are hiking the Angels Landing Trail and don't want to wait for the shuttle to take you to the Zion Lodge, continue your hike on the Grotto Trail. The first part of the Grotto Trail near the Zion Lodge follows the old Floor of the Valley Road that preceded the current road. The old stone building at the Grotto was built in 1924 and served as the first museum until it was reworked in 1936 to be a residence building. Resident artists often stay in this building.